Today, as I write this, is Wednesday. Maybe it’s fortunate that I learned it was Wednesday, the day I usually write my second column of the week. “So what?” some may ask. So we jumped in the car and headed to the Chinese buffet eatery in Torrance. So we made a dash to the exit. By the time we got home it was about 8 p.m. I turned on my computer and prepared to write. Only problem was, I didn’t have any idea about what to write. So I sat there, staring at the computer, hoping something would pop into my mind. Jokingly, I mumbled to myself, “Maybe I should call Maggie and she might give me some ideas.” I tossed that idea into the trash can. So, here I am, trying to think about ideas I might be able to use to fill my Rafu space. And yeah, I can hear Maggie laughing when she reads the above. Oh well, I guess there will always be goofs like this one. 1. Write about your favorite dishes. I know you like soup, especially miso shiru. Ask Mrs. Y. for some recipes so they can be included in your column. 2. Write about some of your thoughts as you sit on the front porch and see the cars and people passing. How’s your neighbor across the street doing? 3. Write about your early days in Redwood City. 4. Write about how you met Mrs. Y. 5. Interesting trips you have taken, besides Las Vegas, and incidents that occurred while on those trips. “I am writing to you for an interview. “I know that you touched on your experience living and working in Japan for a few years, starting in 1962. I am interested in the attitude of Japanese citizens toward foreigners during that time. Especially, my interest is how people hosted foreigners during the 1964 Tokyo Olympics. “It has been said that the Olympics is a symbol of human harmony of races and diversity. In order to think about what Japan should show in the next Olympics, I think it’s important to look back at that era and know what attitude Japanese citizens had toward foreigners in 1964. The writer of the above was Tetsuya Mizuno. As a journalist, I rarely receive request for interviews, and when I do, I usually do not accept the requests. I enjoy writing about my experiences over the 60 years I’ve been a journalist, but I don’t like to talk about my life as a writer. I’m sure Mr. Mizuno will understand my position as a fellow journalist. Like most of you, one of the features I glance at when I get The L.A. Times delivered at my house are the obituary notices. Yes, mainly to see if there might be a name of a JA friend. Needless to say, there is always at least one JA name published. It was not a Japanese American but an individual named Bob Fletcher, who quit his job as a state agricultural inspector during World War II to save the Sacramento farms of interned Japanese American families. He passed away in May at the age of 101. 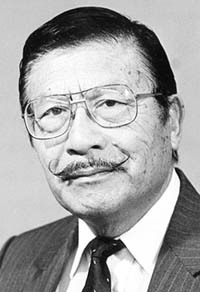 When Fletcher tried to help Japanese Americans who were forced into camps in 1942, he was taunted as a “Jap lover” and nearly hit by bullets fired at him. Undaunted, he stepped in to save the farms of the Nitta, Okamoto and Tsukamoto families. He worked 90 acres of California table grapes, paid the mortgages and taxes, and took half the profits. He turned over the rest to the three families when they returned to Sacramento in 1945. “Few people in history exemplify the best ideals the way that Fletcher did,” said Mary Tsukamoto, whose family farm he saved. Thought some of you may find the enclosed photo interesting. It’s a photo of Japanese Americans who were interned in Hawaii during World War II. Sure doesn’t look like our camps, does it? At any rate, on Saturday, Oct. 26, at 2 p.m., the documentary “The Untold Story: Internment of Japanese Americans in Hawaii” will be shown at the JA National Museum in J-Town. (Editor’s note: For those who missed it, “The Untold Story” is available on DVD from the Japanese Cultural Center of Hawaii, www.jcch.com). Yeah, can’t write a column without mentioning Las Vegas. How often do players actually win in the casinos? Well, new data provide some answers. Casino billboards lining America’s roadways tantalize motorists with the lure of riches. “Easy Street. It’s only a few plays away,” scream the roadside signs. But, how often do gamblers really win? What are the chances that a gambler will really win on a single day or over a longer period? On any given day, the chances of emerging a winner aren’t too bad. The gamblers won money on 30 percent of the days they wagered. But continuing to gamble is a bad bet. Just 11 percent of the players ended up in the black over the full period and most of them pocketed less than $150. The analysis comes from a database containing anonymous records of 4,222 Internet gamblers who wagered for at least four days on casino-style games of chance such as blackjack, roulette and slots. Maybe it’s a good thing I’m looking for a driver to take me to Vegas and can’t find one. Well, as I said, I can always drive myself, which I am planning to do in two weeks. Did I mention baseball today? No, but in a recent column, I chatted about Shane Victorino, a former Maui resident, who played with the Dodgers last year and now has taken the Boston Red Sox to the World Series. Well, here’s another baseball tidbit about Carl Keiji Iwasaki. The 51-year-old native of Kaneohe, Hawaii, is one of only three Japanese Americans to hold the title of head coach of a Division 1, NCAA baseball team. The other two being Dave Nakama of San Jose State and Miki Aoki of Notre Dame. Iwasaki is head coach at University of Northern Colorado and was selected as 2013’s Great West Conference Coach of the Year by his peers and College Sports Madness. He guided his team to a 20-7 record this year. He landed his first college head-coaching job in 2003 when he was selected to lead the baseball program at Austin College in Texas. Among players he recruited for his college team are Ryan Yamane and Tyler Yamamoto, both from Hawaii. In closing, I’m sure glad to find this out. I thought I was getting old. Ever walk into a room with a purpose in mind, only to completely forget what the purpose was? Turns out, doors themselves are to blame for these strange memory lapses. Psychologists at the University of Notre Dame have discovered that passing through a doorway triggers what’s known as an “event boundary” in the mind, separating one set of thoughts you had in the previous room and preparing a blank slate for the new locale. Thank goodness for studies like this. It’s not our age. It’s that damn door. I’m probably a bit short today, but with my schedule I guess I’m lucky to get this much. How was your trip to “kanaka-land,” Gwen?